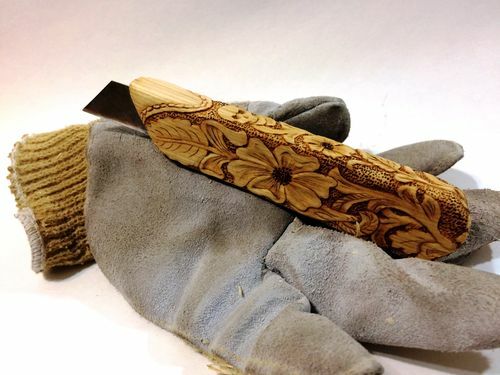 When I started carving, I found that a plain utility knife worked quite well, especially with my limited sharpening experience! Lynn Doughty has inspired a lot of people to give them a try and I still use mine quite often. Although the handle is comfortable to me, it is kinda plain in appearance compared my Helvies and other knives, so i decided to fancy it up a bit. 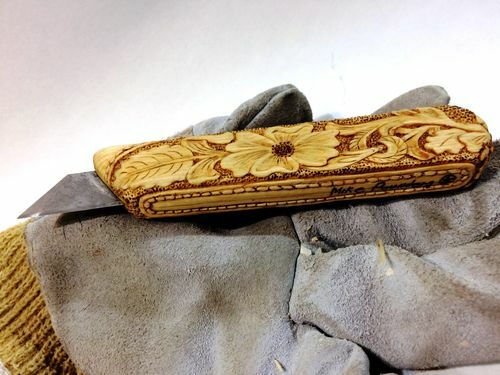 I own several, but I made this one by epoxying a blade between two pieces of pine. 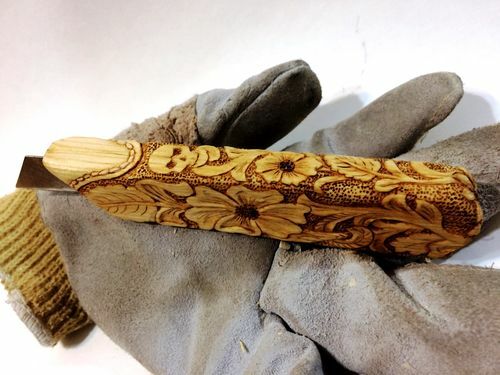 I thought I was going to teach a beginning carving class and I had the idea to make some like this for students to use. Total cost was about 25 cents! I’ve used to do leather work and I’ve used the patterns before on canes, but I’m a fan of Jordan Straker and his realistic carvings of leather and clothing. This didn’t turn out too bad. Thanks for looking! That is really cool. I am a flooring installer and use utility knives everyday. I’ve never had a knife that neat. I love the carvings. Thanks for posting!! Good job Mike. I bet the blade is more stable that way. Very meticulous and detailed. You’re the carving king Mike.